How can coffee improve your life? The SupermarketJournal: Packaging World Magazine. Brew your own beer, make your own wine, roast your own gourmet coffee! The average Joe will soon be able to roast his own cup of Joe. For years coffee lovers have been able to brew their own coffee, but until recently, roasting the beans has been done only by large companies or gourmet coffee shops. 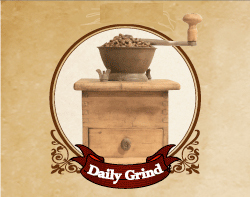 Currently, coffee is roasted by heating hundreds of kilos of beans in a rolling drum over an open gas flame. A new method, being preferred by Cordoba Coffee Ltd., would eliminate the need for a roller system and subsequently, the roasting company. Instead, coffee beans would be roasted using hot air, and in much smaller settings. “The idea is to bridge the gap between the traditional roaster and everyone else. Everyone wants to be a gourmet roaster,” Cordoba president Claudio Cordi tells the Supermarket journal. He is developing an automated roasting machine which can be placed in supermarket or coffee shop. The ‘Java Master’ will be able to roast close to two kilos of coffee for a customer in five minutes, he says. Furthermore, it will fit into almost any bit of free space or any store corner. “I believe that any store that has at least 200 sq ft. available would do well this machine,” Cordi says. The ‘Java Master” is about the size of a specialty display – six feet in height, three feet deep and three feet wide. He says customers, with help of a staff member, would select their roast from up to 12 different bean choices. If a customer wants to blend their roast the machine will mix the beans proportionately. Once the roaster have been filled and set, it can be left into its own devices. Cordi says, the ‘Java Master’ has a predetermined shut off for when the roasting process ends. The shut off can be over ridden, he says, if customer wants to darken or lighten the roast. The compact machine utilizes a 50 amp. Turbine to create five minutes to extremely hot air, which cooks the beans in a large glass bowl. “this way the beans don’t have to wait for the roller to heat up, they don’t have to wait for the energy, they are roasted in the energy,” Cordi says. The turbine is also used to cool the machine. Cordi says the technology, barely three years old, only works for small-scale roast and is therefore ideal for supermarkets and coffee shops. The roasting station itself is comprised of four components: the “green bean” storage, the roasting unit, an interactive monitor and a receiving station. Cordi says the “green bean” storage can be equipped with up to 12 different brands of coffee bean. The roasting unit is built on the top part of the ‘Java Master’. “It’s very visual. It lets you hear, smell and see what its happening.” He says. “It draws you in. it is like in a bakery.” The interactive monitor is used to prepare the roast by selecting the specific blends. It has a help function and when not in use will display coffee facts or advertising. Cordi notes that the ‘Java Master’ can be programmed to accept all types of advertising, allowing the owner to generate additional revenue. “Stores can advertise other parts of the coffee shops or store.” In addition, the internal computer can also be used, with a computer disk, to store customers favorite roast settings or blends. Cordi says they are now working to develop a “memory or client card” that would connect to the computer system in the roaster and contain details of your coffee desires. Stores can purchase the roasting station for under $40 thousand. Cordi says the only cost after initial purchase is in beans. And even that has its merits. “You can also manipulate prices; say when the market went high like it did last year.” Meantime, Cordi says they are in process of setting up the first machine in a grocery store chain in Ontario. This may become the new craze in coffee merchandizing.